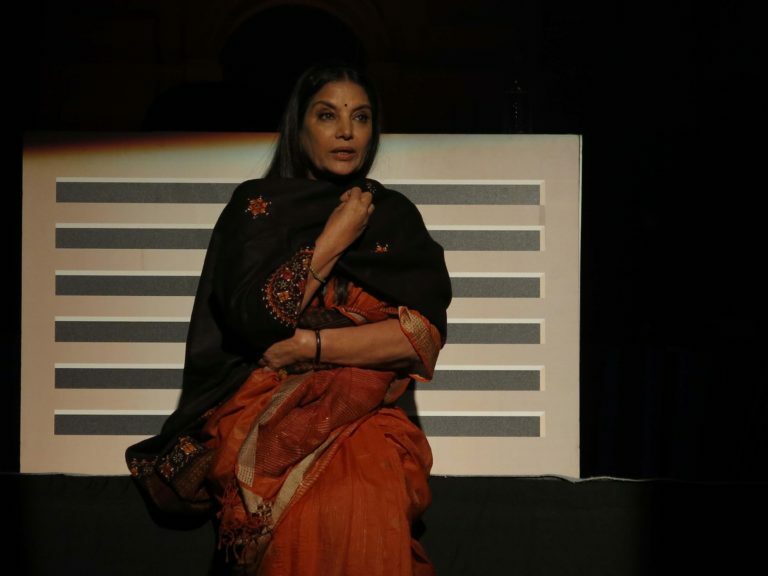 The legendary actress Shabana Azmi proved once again just why she is considered one of the finest thespians the world has seen with a tour de force performance of her one woman show ‘Broken Images’ at London’s Logan Hall…. ‘Broken Images’, adapted from the acclaimed Kannada play ‘Odakalu Bimba’ by the renowned playwright Girish Karnad and directed by Alyque Padamsee, tells the story of Majula Sharma – a marginally successful Hindi short-story writer who finds overnight fame and fortune after publishing an English language novel written by her late twin sister Malini. Azmi essays the roles of both Majula and Malini – one on stage interacting with the other via a TV screen – in what has been described by critics and theatre producers as one of the most technically challenging roles to emerge in India in recent years. Azmi was masterful as she captured the intense conflict that brews inside Majula who – despite her new-found fame and fortune – begins to question her own competence and whether she has betrayed her culture, language and family. Her performance brought the near-1000 strong audience at Logan Hall to their feet for a series of resounding ovations. What was even more remarkable was the fact that Azmi’s performance was the culmination of a whirlwind 5-day visit to London during which she has done an intense round of media appearances whilst also delivering a speech for the ages at the Palace of Westminster. One critic said of her performance, “In a play that demands all her considerable technical skills, Azmi delivers with a performance that is towering in its subtlety”. ‘Broken Images’ was presented by Baithak UK, a not for profit arts company dedicated to promote the legacy of South Asian culture in the UK. Sangeeta Datta, founder of Baithak UK said: “At Baithak UK I like curating arts experiences which are residual, which you take back home with you, which make you think. Broken Images transfixed a 1000 strong audience and Shabana Azmi’s nuanced performance offered a thoroughly immersive experience”. “The Q&A brought the artist closer to the audience and finally we were able to offer a cheque for Shabana’s charity Mijwan Welfare Society where she has been working tirelessly for girls education and rural development. “As founder-director of Baithak UK, I am pleased to mark our tenth year with this big scale but meaningful event. It reinforces the idea that there is a large audience here waiting to see good work celebrating South Asian arts legacy”, Ms Datta added.